Recently, I read a book, ‘Warren Buffett Invests Like a Girl and why you should, too’ written by Louann Lofton and published by The Motley Fool, a well-known U.S.-based stock analytical and research firm. It has been a great read and highly recommended for all who aspires to build a profitable portfolio through savvy stock investing. Now, if you have little spare time to read the 200+ page book, do not worry! 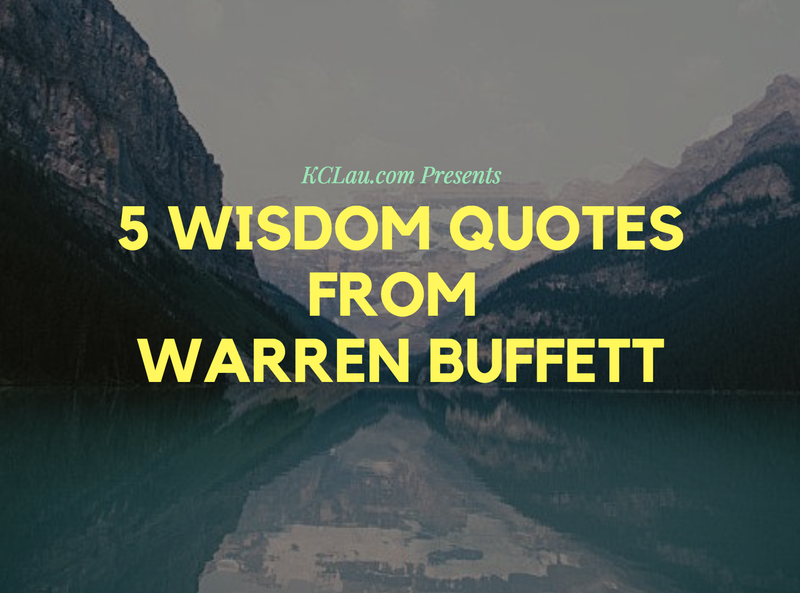 In this article, I will share 5 wisdom quotes that I have personally discovered from this book which I find them useful to help us become better investors in 2019. If you aren’t willing to own a stock for 10 years, don’t even think about owning it for 10 minutes. The focus, I believe, is not so much about the ‘number of years: 3, 5, 10 or even 20 years’ you intend to hold onto a stock after having purchasing it. Rather, the issue is related to our mindset and our beliefs about what stock investing is. To Buffett, an investment into a stock is about purchasing a stake in a business, preferably one that is profitable, well-managed and has the ability to expand in the future. It explains why Buffett’s favourite holding period is ‘Forever’ if it is a business that continues to deliver stable and growing profits for the long-term. May I invite you to assess the logic for buying shares of ABC Bhd? If your basis is not business-like, where the basis has nothing or little to do with its business model and financial results, most likely, you are not really investing but speculating or gambling. In this case, I reckon that you may need to relearn what true stock investing is before making your next stock purchase. It is vital if you wish to build a profitable stock portfolio over the long-term. Buffett places greater emphasis on ‘Quality’ of an investment over its ‘Price’. Unfortunately, most do not. As I write, many are basing their decisions to buy a stock on its price, whether it goes up or down. Very little focus, if any at all, has been placed on the fundamental qualities of a stock. To me, it is quite illogical. It is like a trip to your local wet market to buy fishes. Do you first check out the ‘Quality’ of fishes before bargaining for a better ‘Price’? Or, do you instead first bargain for a better ‘Price’ before checking out the ‘Quality’ of these fishes? What is the point of buying ‘Rotten Fishes’ even if they are priced substantially lower than ‘Good Fishes’? But, that is what many people are doing in the stock market today. Do not be surprised. It explains why 90% lost money in attempts of making money in the stock market today. Ouch! There are Good Fishes and Rotten Fishes in the Stock Market. Learn how to differentiate the Two. Keep the Good Fishes and Avoid Buying the Rotten Fishes. Invest in the Cheapest of these Good Fishes. Approval is not the Goal of Investing. You’re Right because your Facts and Reasoning are Right. I believe, many who asked questions like: ‘Is ABC Bhd a good stock to buy?’ are seeking for approvals about their decisions to buy or to avoid buying the stock. It is human nature as we do have a sincere need to be loved, be respected, and be accepted by our family members, friends and community that we involve in. This is because we are relational beings and are designed to feel great if we are approved by people whom we have great respect for. Right? But, unfortunately, investing is not an exercise where ‘I jump, You jump’. It will be dangerous if you approach stocks that way. Many lost money from stocks as a result of buying them after listening to their friends and family members. The act of purchasing shares based on stock tips and rumours is one of the quickest way to incur losses in the stock market. Instead, investing is most profitable if it is done business-like. That is why savvy investors like Buffett read annual reports. It is because investors would want to know the business model, its management team, financial results, and its plans for growth … etc which are mostly based on ‘Facts’ and not ‘Tips and Rumours’ before investing their money into acquiring shares. Thus, if you ask me ‘Is ABC Bhd a good stock to buy?’. My next reply is, ‘Did you read its annual reports?’ instead of a common Yes or No answers as to whether or not you should be buying the stock. The lesson is therefore, seek ‘Facts’ and ‘Knowledge’, not tips, rumours, and speculative remarks. You don’t get Paid for Activity. You get Paid for being Right. This is not true. To appreciate this, you must understand that investors are not traders. Investors invest. Traders trade. They are not the same. If you think the two is the same, you will be confused as to what investing really is and how an investor build his wealth sustainably through investing in the stock market. Investing is not about ‘Buy – Sell – Buy – Sell – Buy – Sell’. That is trading and the aim is earn active income from their trading activities. In most cases, investing is about ‘Buy – Hold – Collect Dividends – Collect More – Keep On Collecting as long as… the stock remains increasingly profitable’. Thus, there is little activity involved in investing. It is a matter of buying stocks with a lot of good fundamental qualities and enjoy passive income for a lifetime. So, what is the first thing that one should do to be successful in investing? Is it to open a stock brokerage account and start buying shares? Nope. In fact, a lot did just that, lost money, and felt disappointed with the stock market – They have unknowingly speculated stocks believing that they are ‘investing’. Instead, I believe one should start by learning the fundamentals of investing first before purchasing anything in the stock market. Why? Because you are paid only if you buy right, not if you buy and sell a lot. Investing is not so much about predicting where the markets would be moving in the future. To most, it is a futile exercise that benefits little. Rather, investors know that it is a reality that markets could go up, come down, and move sideways. As a result, investors would make preparations in all of the three scenarios before investing. In other words, they know what to do when a stock goes up, comes down, or move sideways after purchasing it. It is wisdom. In a crisis, most people tend to be fearful. So, how do investors prepare for it? First, at all times, it is prudent for investors to keep some cash reserves. This is because they can be useful to service their obligations without selling off their investments and to capitalise on new investment opportunities in the event of a crisis as they are usually offered bargain prices. Anticipation of a Crisis to come before it happens. Building a Cash Reserves in Advance to Prepare for the Crisis. Having a Watch List of Good Quality Stocks which you are confident to invest if their prices fall during the crisis. If you do not have the above, it is pretty hard for you to feel confident if a crisis is to happen in the future. Thus, before the next crisis occur, I believe, it is wise for you to start preparing so that you are in position to profit from it if it arises. In other words, prepare for the worst of times and all you will know is the best of times.